The motorcade carrying President Barack Obama arrives at the Robert Trent Jones Golf Club where the President is expected to play golf in Gainesville, Va., on May 17, 2014. President Obama caught a lot of flack earlier this week for golfing Saturday with a lobbyist, a Dallas lawyer and the chairman of a Texas utility who also sits on the board of Halliburton. The game drew attention because it was unusual in two ways. First, Obama decided not to play on his favored golf courses—Andrews Air Force Base and Fort Belvoir—but at the swanky, invitation-only Robert Trent Jones Golf Club on the shores of Lake Manassas in Gainesville, Virginia. Second, he swapped out his usual coterie of junior aides for a foresome that looked like a political schmooze fest: his former Trade Representative Ron Kirk who now works at the law firm Gibson Dunn, CenterPoint Chairman and Halliburton board member Milton Carroll and lobbyist Joe O’Neill of Public Strategies Washington. The combination got the attention of the press.”I think he played a game of golf,” said White House spokesman Jay Carney, when asked about the round. The White House declined to provide any further information about the outing, or what was discussed. Kirk, a former Texas secretary of state and mayor of Dallas, also knows Carroll from Texas circles going back to the 1980s. But Carroll had a second ticket onto the first tee: Obama knows Carroll from Chicago, where Carroll has served as a director of the Healthcare Service Corporation since 1998 and as its chairman since 2002. Michelle Obama has connections with the University of Chicago’s medical school, and many longtime Obama family friends hail from the medical and healthcare worlds. Saturday was the first time O’Neill and Carroll had met, according to two friends of Carroll. “He was asking me about Joe after that game and said he was a great golfer,” says Texas State Senator Rodney Ellis, who has known Carroll since high school. So, did the men get into Carroll’s support for the Keystone XL pipeline or O’Neill’s lobbying agenda? None of the four are talking. 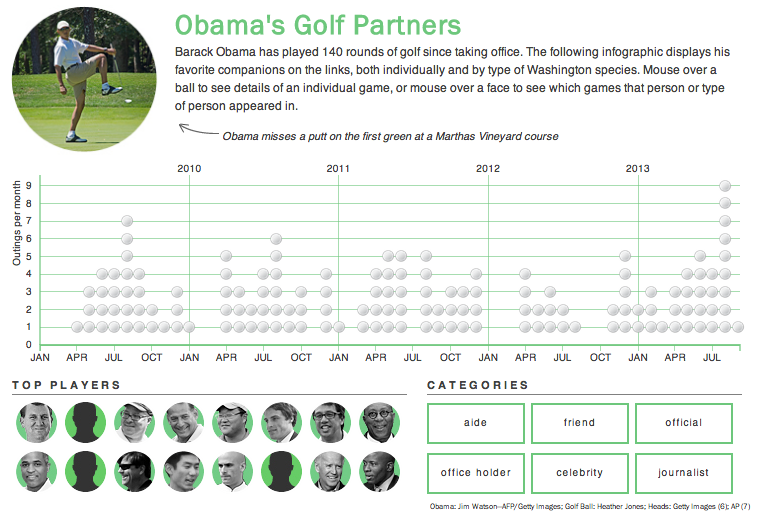 For more on Obama’s golf partners, see this interactive graphic below, which is current as of the beginning of 2014. CORRECTION: The story originally misstated the cities where Kirk and O’Neill work. Kirk works in Dallas, and O’Neill has not recently moved from Washington, D.C., to Texas. Also the story has been changed to reflect the proper spelling of Bristol-Myers Squibb.